I am not a planner. I do not like to plan things ahead. Except for work related stuff, which I am paid to do and trained to do, I never good at planning anything. Even vacation, I did not like to do the planning until N asked me several times and got mad at me. I know, this is bad. But don't you think that things happen outside of your plan is more excited? Things that come out of a sudden burst of idea, things that do not follow the usual path. Like, when I first started this blog, I just followed my sudden urge to do it. No plan, no preparation, no research. Just go for it. I still feel so amazed and so full of gratitude that there are visitors/readers who like what I posted. In the rare occasion that I do plan ahead, things usually do not turn out as expected. I was in the mood of trying new baking recipe last Friday night. I wanted something simple and easy to do, but at the same time, N for sure would like it. So, it has to be something chocolaty. N has also been asking for banana bread several times. Since I got two really ripe bananas on hand, why not combine these two yummy ingredients together. 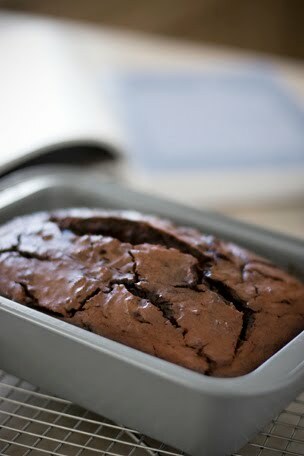 Scanned through Dorie's book, found a recipe exactly what I wanted - a Cocoa-nana bread. Even the name sounds cute! So, I prepared to make it on Saturday morning. Although it was the first time I tried the recipe, I trusted Dorie Greenspan. Besides, what can go wrong with banana bread? I decided that it should be delicious enough to blog about it and on Friday night, I was already planning on how to take the picture. I got up very early on Saturday to make the bread because I love having the freshly baked goods smell in the house in the morning. I followed the recipe all through. When the bread came out from the oven, it looked promising. But, the first bite of it got me wonder if there was anything wrong with my taste buds. The cocoa flavor was so overwhelm and the sweetness of the banana was completely lost to the bitterness of the bitter-sweet chocolate. I had a second bite, but still could not get use to the taste. I was upset and disappointed. I lost all my motivation to take pictures. But since I had setup my picture setting already, I did take a few shots just to practice my photography skill. N, being such a picky eater, to my surprise, did not complaint too much though. Just said it was not great, and then kept eating. Curious of what other bloggers think about the recipe, I did some research on the internet. It turned out that this recipe had been tried out by the Tuesdays With Dorie group and several bloggers did not like it either. It is now Wednesday night, what do you think happen to the bread? It's not in the trash can. It's been mostly consumed and a small amount left in the fridge. Strange things happened during these few days. The cocoa mellowed out and all the flavors melted together, and the bread wrapped in saran wrap is still moist! I had a big piece after I got home from work today. What a strange loaf of bread! love the look of this moist and decadent cake! The Coco-nana bread looks definetely amazing. And all whit props. B-U-T-ful and lovely. I'm not sure what happened to the loaf but it does look absolutely lovely! Chocolate and banana are a fantastic combination. Meetak - Thanks for stopping by. The cake looks great, but I didn't like it until 5 days later! Egle - You and me are alike :) Planning gives me a headache! lisa - I have no idea what happened to the loaf too. May be too much cocoa powder. But luckily, giving times, the combination did work. I've never made a Dorie Greenspan recipe, but she certainly seems popular and loved. I've made a few desserts that are better "cold" so to speak...most of them involve fruit too. I think that taste of the fruit might become more 'infused' into the rest of the cake (or bread) perhaps? Indie.Tea - Yes, I think somehow that must be it. 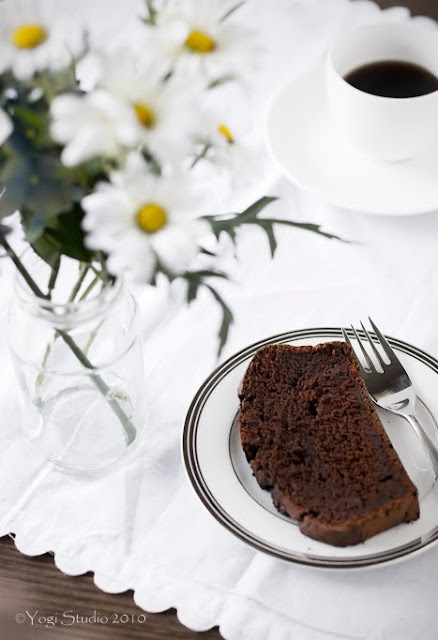 In this case, the 'infusion' of the cocoa and banana did help the cake to taste better.